Wooow what can I say! Many people told me it wasn's so good.. well, I have to say, I LOVED IT! There was a lot of pop-surrealism to me! Which is my fav art movement! The Mad hatter (of course)! Johnny Depp is always one of the greatest actor! He is so perfect for Tim Burton movies! The Red Queen. Well, Helena Bonham is so crazy!!! i always love the characters she play! And the Cheshire Cat was just the best!!! The story is so different from the cartoon, but I knew i didn't have to expect a re-make of the Disney movie. By the way i was really happy to see it, it's like livin in a dream. 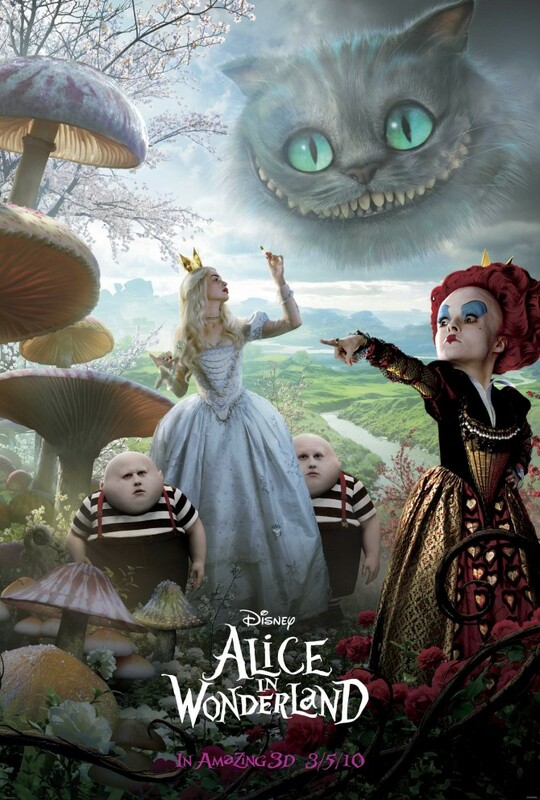 Once again, Tim Burton showed his genius art of making AMAZING movies! wow.. io non l'ho ancora visto ma andrò a breve, e sono contenta di sapere che non è un remake del cartone disney, visto che anche quello è solo una interpretazione del libro originale di Carroll (o Dodgson ^_^)! Dai primi del 900 ci sono state ben 12 trasposizioni cinematografiche su Alice.. ma Tim è Tim, e so già che amerò questo film! OMG i cannot wait to see it - we're going on 16th.... ooh it's exciting!!! well, i live in america and Alice in Wonderland just came out today. i'm going to see it in a few hours, actually. so i didn't read your post--i'm going to read it after the movie to see if we share the same sentiments. check me out some time. i'm a new follower of your blog. now i've read your review. yes, we pretty much agree. burton/depp are great together. Hey,just happened to blog hop. Omg I'm DYING to see how this film turns out, like heck yeah! Quite a nice blog you've got out there! Hope you visit my page sometime. Hi! Thank you so much for following my blog :) am following you too! come by and visit again..
yes! i'm so glad you enjoyed it. i cannot wait to see it and i was afraid it wouldn't be great bc of what everyone has been saying. as soon as i'm over this cold i'm going to see it! I loooved it too, Ive heard people saying the same thing...but I really thought it was perfect!